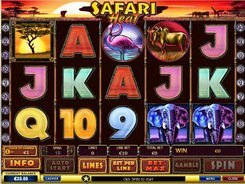 Five-reel fifteen-line Safari Heat video slot challenges you to the African savannah to hunt the most dangerous wildlife animals living out there. 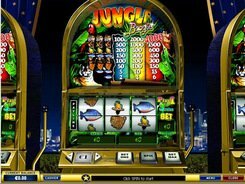 During the safari trip you will encounter lions, elephants, rhinos, zebras, flamingos and other animals that can create winning combinations with impressive payouts. 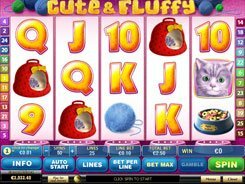 You can bet up to ten coins per line and set a coin denomination from $0.01 to $5. The largest coin jackpot makes up 10,000 granted for hitting five lions on any activated payline. The king of beasts is the wild symbol that transforms into other missing symbols to form winning combinations. 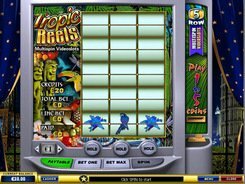 Three trees scattered anywhere across the reels give 15 free spins with a x3 multiplier. 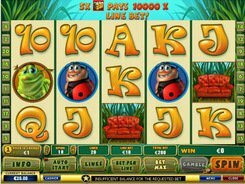 An easy-to-play Gamble feature is optionally activated at the end of each winning spin. In the Gamble round, you should pick either red or black suit color. 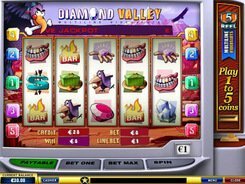 A correct choice will double up your winnings, otherwise, you lose your cash prize won in the latest main game. PLAY FOR REAL MONEY!